A professional stylist offers tips & tricks for decorating your log & timber home for Christmas. Christmas is the time for traditions—for honoring old ones and creating new. It’s a time for decking the halls, welcoming friends, and creating memories. 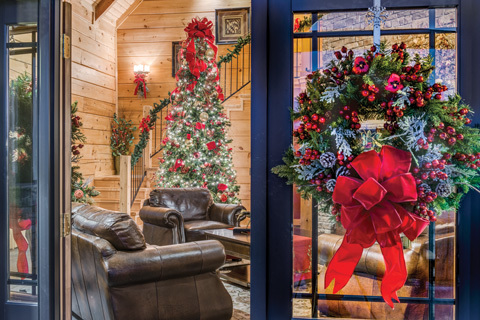 Last year Honest Abe Log Homes engaged stylist Lexie Nale, owner of At My Front Door in Charleston, South Carolina, to create a home for the holidays at its model in Crossville, Tennessee. We talked with Nale to get her insight and advice about decorating a log home for Christmas. “Decorating a log home offers both challenges and opportunities,” Nale said, pointing out that the soaring ceilings, towering windows, wide-open living spaces, and imposing chimneys typical of many log homes require special decorating considerations, as they did with this home. The great room is one and one half stories of logs capped by a Douglas fir heavy timber roof system. A two-story manufactured stone fireplace with a mantel and hearth cut from local quarry rock is the focal point of the 1,864-square-foot ground floor. Nale draped the mantle with evergreen and magnolia and placed nearby a towering pine tree festooned with a flowing red bow and clusters of gold and red ornaments. The stylist emphasized that it’s perfectly fine to deviate from greens and reds. The finish of the logs and floors greatly determines whether to use light colors or more intense colors, Nale observed. “For example, the naturally finished eastern white pine walls in this log home and the number of large windows created many reflective surfaces on the walls, flooring, and ceilings, so using rich, deep colors worked well,” she said. Nale said that with darker wood she would use lighter colors, strategically placed lights, and perhaps add glitter or mirrors. Greenery such as magnolia leaves, holly, cedar, pine, and other evergreens can be used throughout the home in large or small quantities. Nale hung several of her company’s custom-designed wreaths, adding hints of evergreen, holly, magnolia, pinecones, and berries inside and out. Nale said it’s never too soon to plan for holiday decorating. You can enjoy this home’s Christmas decorations during Honest Abe’s annual Christmas celebration, which kicks off this year on December 8 at 10 am, when guests enjoy a cup of hot cider and a free log home tour, including this home, which remains decorated for the holidays through New Year’s.